Ahhh, the great feeling of post race body aches. That was two weeks ago.. Now (on holiday) I am missing that feeling! 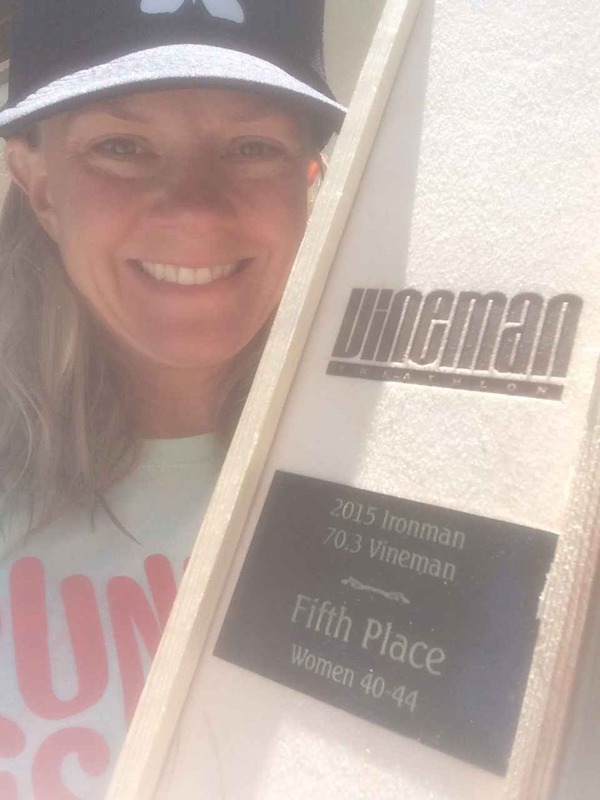 I think Vineman has become one of those races that keeps me sane, happy and truth be told – keeps me going in this sport. 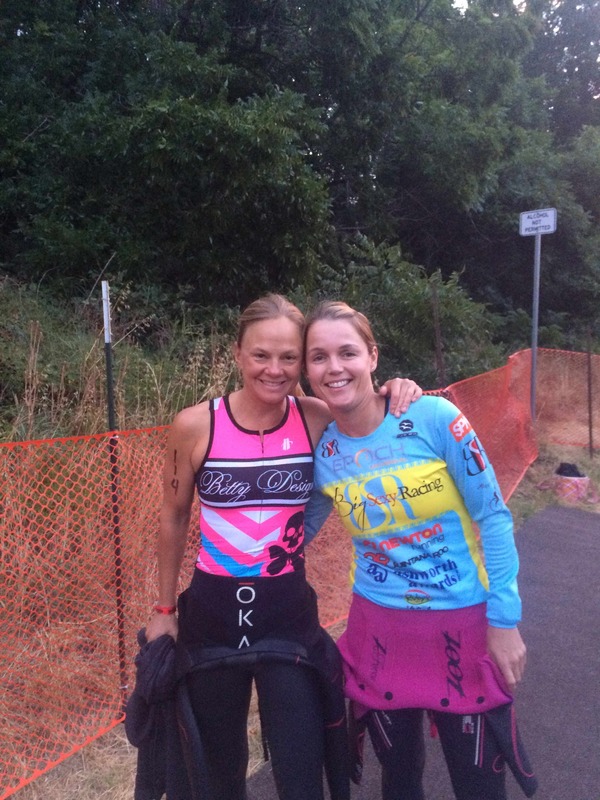 I have finished this particular 70.3 several times and after each one I have always said “next year I will…..”. I will train harder. Run more hills. Train for heat. And year after year something plagues me from having my so-called “best” event. Instead of being a particularly “fast’ even for me, it turns into an event that means the most. Don’t get me wrong, I did have a decent day out there. I qualified for Worlds* (in Austria). I got on the podium. I had a PR in the swim. I won some wine. I had fun. I SMILED. Happy with another “box” of wine!!! I have learned to do that in my past years of racing. Yes, still competitive, but if you are going to push yourself 5+ hours nonstop, why not have fun doing it? I mean, it’s not like I am going to earn a living anytime soon from top age group finishes (ahhhhh if only)….. 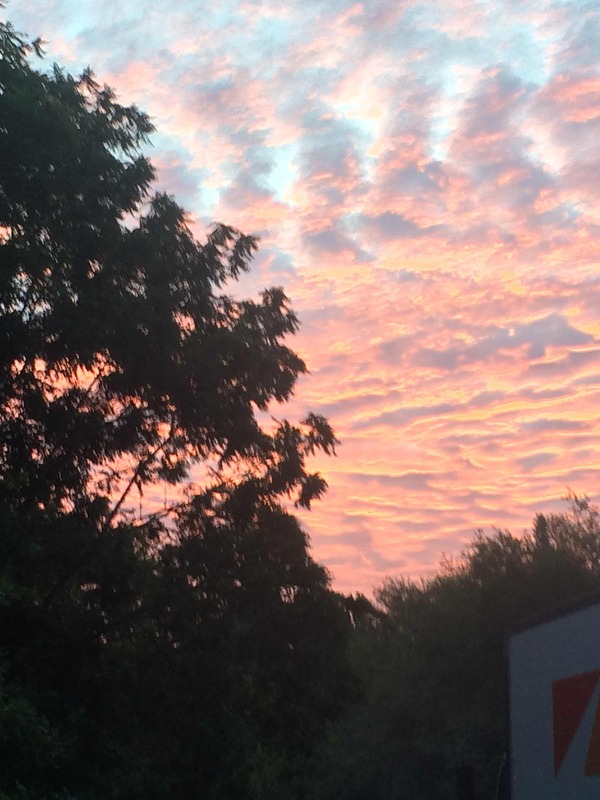 If this isn’t a reason to wake up early…. We were biking distance to the start so it worked out quite beautifully getting there. No traffic, no packing up bike, no chaos. 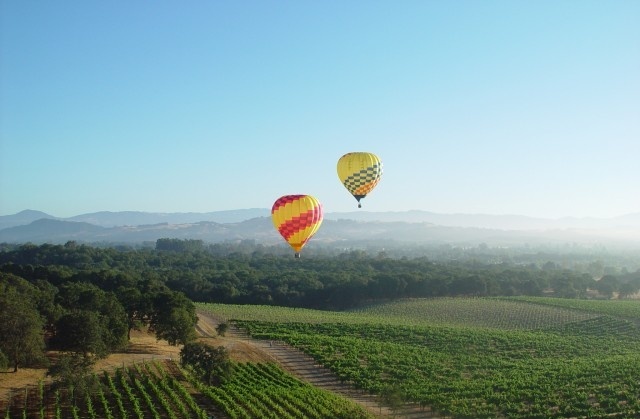 I have raced Vineman numerous times, and each time I have found myself staying in different places throughout Sonoma County (life so hard, eh?!). Last year I was at the finish line, this year at the start in Guerneville. Fabulous place and recently voted “top best small town for food”. YES! My particular age group was in the third wave, right behind the pro men and women. Score!!! Last year I was in one of the last waves which meant for a hot, long day. Wow what a difference a start time makes (and about 2 hours!)!! I went through all the normal pre-race rituals in setting up my transition, and made my way to the water for our 6:30am start time (never been so happy to be in the 40+ age division!). Gun went off and the race had begun!! The swim couldn’t have been better….. since the pros were well ahead of us, it was smooth uninterrupted waters. Two people in my age group took off (I tried to hang on for a minute or two but needed to get back into my own less speedy pace) but other than that I was alone. Or so it felt. There were 2100+ people chasing me but for that particular moment I was alone, racing my own race. Out of the water in 3rd place and happy with my time (nearly 2 minutes faster than last year). Whoop!!! All smiles. Got on my bike and went on my way. Last year I told myself I was OK never racing this course again (the bumpy roads were brutal). Of course, never say never. 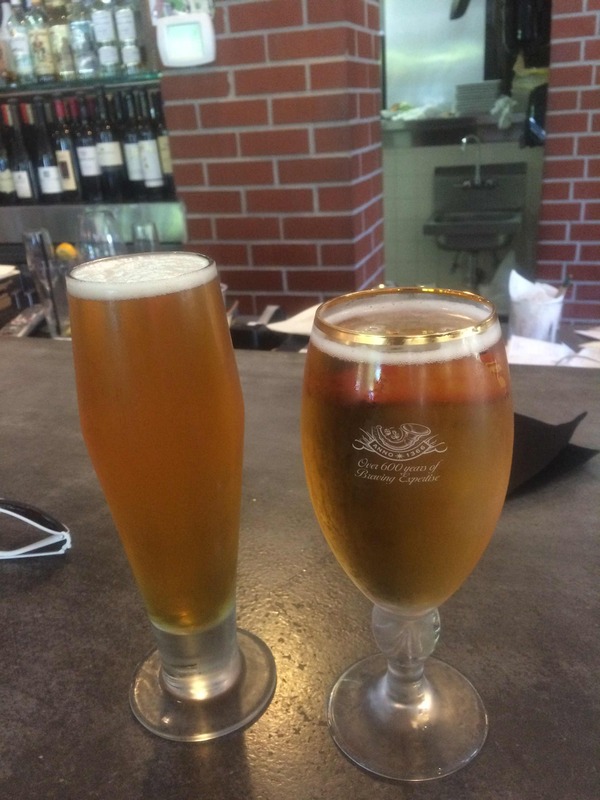 Months after the race I found myself on the waiting list to get back in…. (waiting list + $$??!!!!) Unbeknownst to me until the day before, I find out they repaved the roads! The day would be just perfect. Smooth roads, little traffic, great views, and vineyard “teasers” along the way. I tried to soak it all in and I must say it was the right attitude (except I must admit a bit disappointed to have been injured…. )… Stay HAPPY. About 5 miles into the 56 mile ride, I passed someone… 2nd place!! Whoop!! I knew my run was “off” (kind way of saying out of shape and weeks of being injured) so I just tried to be in the moment of each sport. Swim. Bike. Run. The rule of the day was to only think about the sports I am in at that particular time. Stay PRESENT. 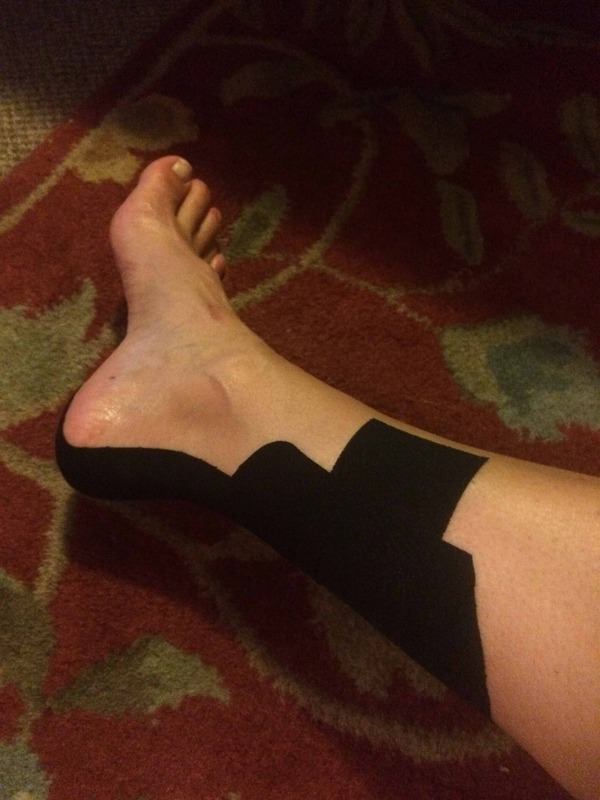 This is my version of K-Tape (Thanks Faye!)…. guess I am a believer since it carried me 70.3 miles!! 2) I did have about a 12 minute “head start” against the first men’s wave. 3) Did I mention I was in the first wave? My mind let me believe I was winning, and that is a fun thought to keep you going for the next 45 miles or so. That was when this guy went flying passed me. FAST. I told him that I have been waiting for him 🙂 A total of about 4 guys passed me before I made it to T2. Not bad! I rode into T2 still in first place (amongst females), happy as a clam. It was a gorgeous ride and I felt no pressure. I actually could’ve stayed on my bike a wee bit longer (that thought never occurs to me!) but time to face the reality of my running shoes. 13.1 miles to go. Hang on. Maintain. The strategy was to start off slowly to insure my calf didn’t seize up and I could finish the race. Finishing is not something I normally even concern myself with (I tend to lean towards the more positive thoughts) but today was different. Just finishing WAS positive. 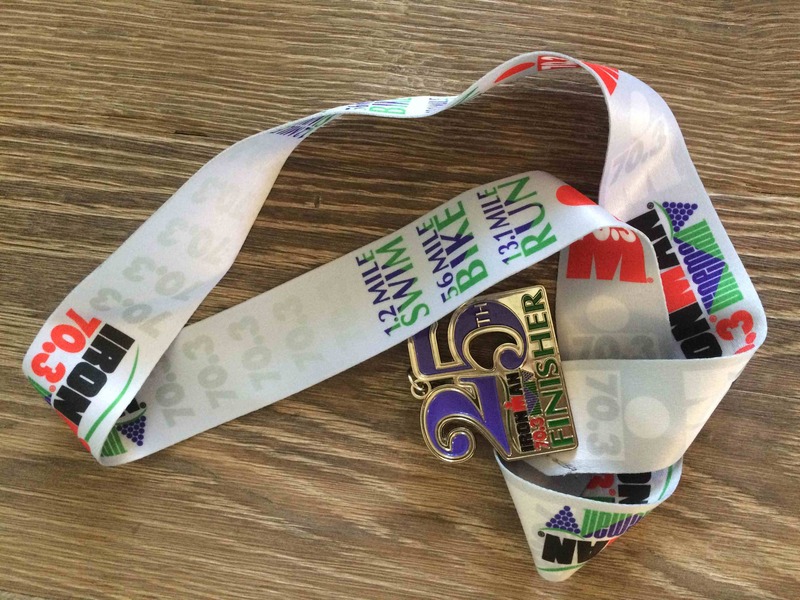 I was nervous about even running, about racing…. so I wanted to lean more towards the cautious route (WHAT?!!!). I know, call me crazy. As the men passed me rather quickly now, I encouragely (yes, I just created a new word) would shout at a few of them “nice job! top 5!” or “catch that guy so you can win a bottle of wine”. It was fun to see the winners in action. Then the women came. Seemingly just as fast! (or at least it felt that way!!). At about mile 8, I tried to “turn it on”. Well, pace increased about 5 seconds. Not good! I was so happy that I was going to finish though so I tried to hang on tough. Big mental games being passed by so many but – hey – that’s just part of going in the first wave…. The fun can’t last forever. I run towards the finish line and in the chute (about 25 yards to the finish) I collapsed. WTH??? Never in my years of racing has that happened. Wasn’t the calf. Wasn’t the nutrition (stomach felt great & the Nuun did wonders!). Not sure what it was. Legs gave out and all I could think of (while laying on the ground) was I HAVE to make it to the finish line and thank goodness this didn’t happen any earlier. Still not sure what happened. There is always that “first time for everything” going on in races. The unknown. This was the crowd cheering me in “YEAH!! !” then “OH NO” then, when I got up again (felt like forever) “YEAH!!!”. Not a good feeling but so happy within minutes I was better (and also happy to now know anyone in that crowd!). 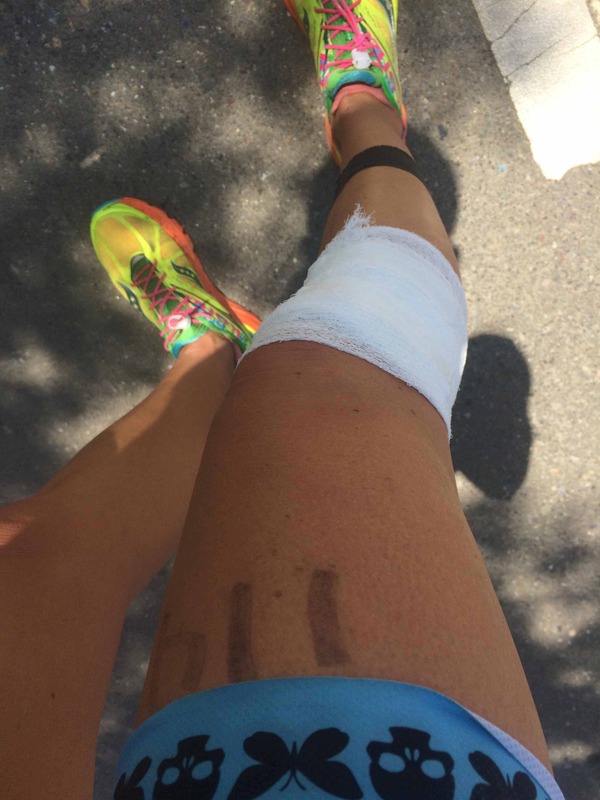 At the finish line, Pro and Ironman champion Mirinda Carfrae asked me what happened (the blood pouring down my leg was a giveaway – although looked a lot worse than it actually was) and I said “not quite sure. 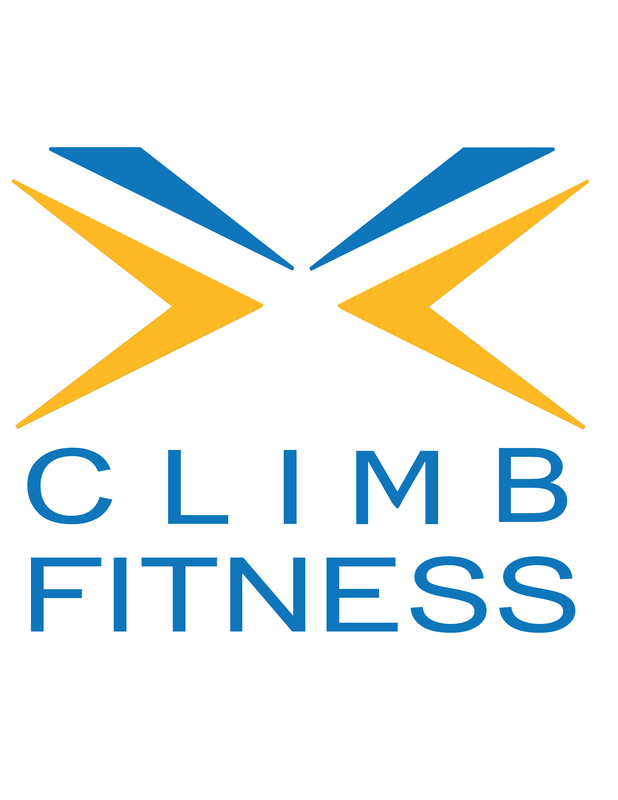 my legs could go no more.” And – she said – “That means you gave it your best”. So, while my best wasn’t good enough to get me an overall win, or a course PR, it was my best for the day. And, at the end of it, that is what matters. ACTUALLY. THIS IS WHAT MATTERS (see lovely child below). BEST homecoming ever!! 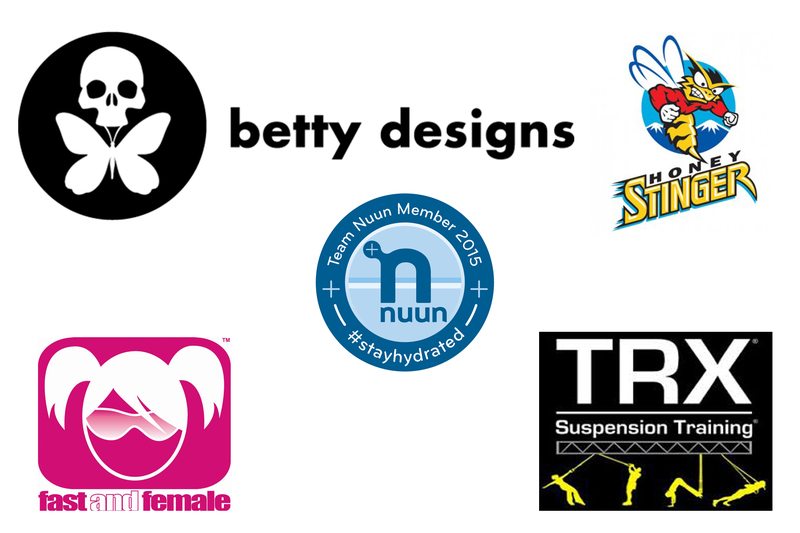 On her own, this girl did W (welcome) B (back) M (mom) and clearly knows about Betty Designs and Nuun!!! Biggest fan!! Now to go drink my wine. 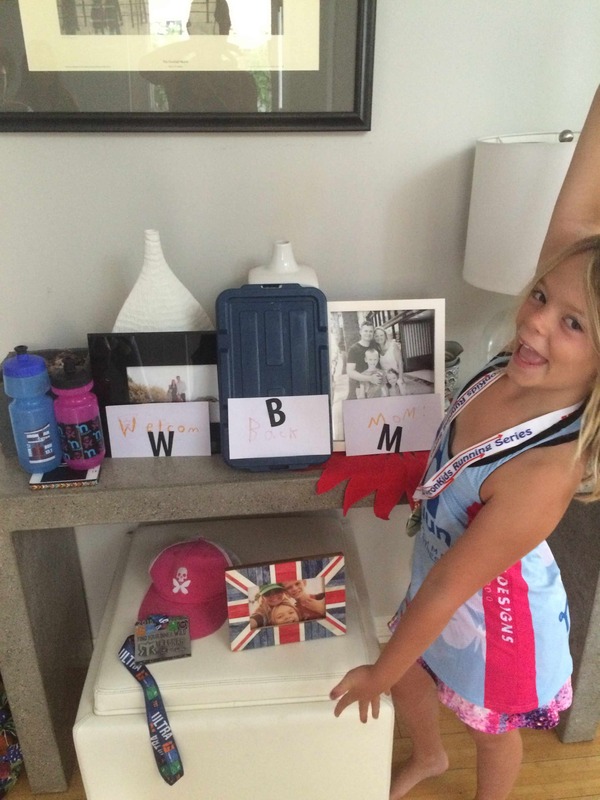 * I reluctantly turned down my Worlds spot this year… If only I could afford every race & every dream! Next time. It isn’t about the miles.